ScreenCastle is a useful service for recording an occasional screencast with out having to download and install screencasting software. ScreenCastle uses Java applet to record desktop screen, so you can launch it in your browser if you have installed on your machine. 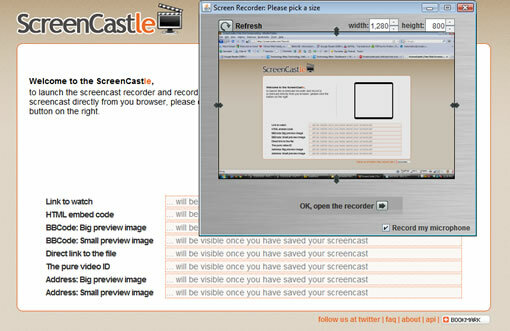 Visit ScreenCastle.com and click the red button, a Java applet will popup, you can select the area of the screen you want to record before starting the recording, you have an option to record voice using a microphone. Once you have setup the screen area, click “OK, Open the recorder” and then start recording. Stop recording after you finish and select preview screencast option. It will upload the screencast and in few seconds you will get all the links you need for viewing, downloadinf, html embed codes etc for your screencast.